Ooty : AMMK is contemplating legal action against the Arunagirinathar, Madurai Aadheenam Pontiff for his continuous remarks that the party will merge with AIADMK in due course. The pontiff continued his remarks about AMMK, a splinter group of AIADMK, that it will unite with the parent party and AMMK will take legal action against him, the party Deputy General Secretary, T T V Dinakaran said here on Tuesday. Dinakaran, here for election campaign, said that the people of Tamil Nadu will not not accept BJP, as Prime Minister Narendra Modi had failed to visit the State, when parts of which were ravaged by cyclone. When asked about DMK president M K Stalin’s remarks that a commission will be set up to inquire the death of former Chief Minister, Jayalalithaa, he said that DMK was confused and shedding crocodile tears over the matter and trying to fool the people. 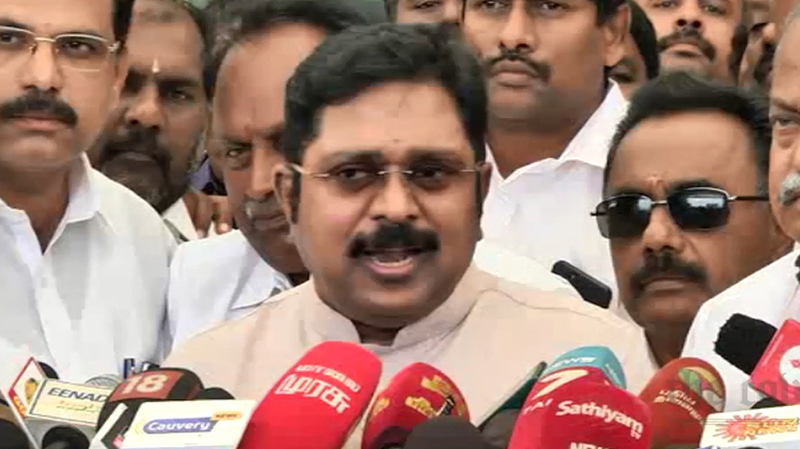 Dinakaran said that ruling AIADMK was trying to postpone the by-elections to the 18 assembly seats, citing seizure of huge amount, fearing the party may lose majority and the government. When asked about the reported seizure of Rs.11 crore from the aide of DMK treasurer, Durai Murugan, he said that he could not comment on that since the money was seized from their premises.